New Colors: Coral, Blue and Teal and Classic Slate! Great New Colors on our paddleboard Pup Decks. Pink, Blue and Teal. 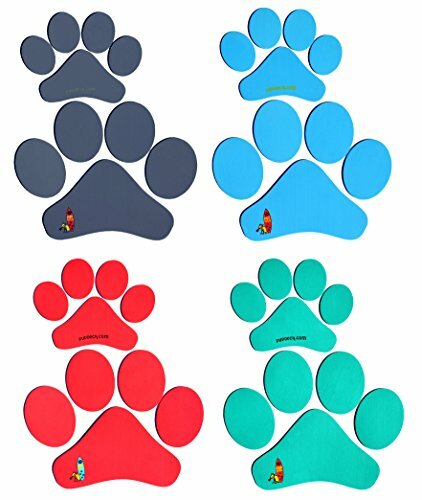 The Pup Deck SUP traction pad for dogs gives grip to your board right where your dog sits, on the front of the board. You’ll find Fido even happier to go paddling with you now that he/she has their own deck pad. With added traction and knowing that the Pup Deck is just for them, your dog will enjoy the stand up paddle surf ride even more than they already do. Watch out, they may take the board out while you’re not home! The Paw Prints Pup Deck consists of two paw print shapes which can be applied separately to your board with a spacing you prefer. The approximate dimensions are 13″ x 10″ for the smaller paw and 14″ x 20″ for the larger paw. Use only one paw if that works for your board (and your dog)!